7 Why has it taken so long? New readers may be interested in first reading our introduction to nuclear fusion. Laser implosion fusion, one of several techniques for Inertial Confinement Fusion (ICF) or pellet fusion, is one of the most heavily researched fusion techniques in the world currently. It has had a tumultuous history throughout the last several decades. Despite the difficulties, it appears that laser implosion fusion should be a feasible power source in the coming decades. In a later article we will be discussing some extensions of this technique call ‘fast ignition systems’ that show tremendous promise of being the first commercially viable fusion power systems. Why is it called inertial confinement fusion? Inertia refers to the fact that matter tends to resist being moved. We require very high temperatures in order to make fusion happen. High temperatures means that we will have a plasma of the fuel ions that will tend to want to expand as it heats up. Fusion techniques all require some sort of confinement. Confinement in this case refers to keeping the fuel ions close enough to each other that they can fuse after they have reached the necessary temperatures. Inertial confinement means we will create the conditions necessary for fusion before the fuel atoms have time to move away from one another. Techniques that utilize inertial confinement fusion rely on heating that takes place incredibly quickly. The systems I have seen so far try to create fusion conditions in a time interval of a few nanoseconds. Laser implosion fusion utilizes sudden heating by lasers on frozen fusion fuel pellets. Pellet of fuel typically have a deuterium and tritium core with a metal sheath. They are usually kept a few degrees above absolute zero so that the deuterium and tritium are solid. High powered lasers heat the outer layers very quickly, on a scale of nanoseconds, causing them to explode. This causes a pressure wave towards the center of the pellet. This rapidly pressurizes and heats the core to the tremendous temperatures and pressures necessary for fusion ignition. When fusion ignition occurs, the fuel in the pellet is rapidly burned, creating a blast wave of charged particles, x-rays, and neutrons that strike the walls of the chamber and are absorbed to create heat. Since these systems rely on these ‘blasts’ of energy, they need to be able to fire within a relatively short amount of time. In order to create useful electrical power, the delays between firings need to be somewhere between one hundred seconds and one fifth of a second. This range is wide because there are still a variety of proposals for how to design the overall reactor. Longer delays would likely require more thermal mass in the shielding so that power can still be produced between firings. Ongoing research is investigating how to build equipment that can create powerful laser beams but are able to cool down and be fired again within these time frames. Current systems typically need a few hours between firings. This is primarily due to laser amplification components that get very hot during even one firing. There are a number of technologies being developed that are expected to be able to fire much more often. Additional difficulties with fast pulsing would be with the target setup and preparation. The pellet needs to be in an extremely precise position, and held by a specific type of equipment. With each firing the target is completely destroyed. Whatever was physically holding the target will be tremendously damaged if not destroyed as well. Ideas are still being considered as to how a practical target setup system will be possible on very short time frames. The laser beams that hit the target must be of equal power. If one is more powerful than the others, it will cause a more substantial explosion and shock wave, destroying the symmetry of the shock waves that propagate towards the center of the spherical fusion core. The power delivered (which turns into the shockwave) is often called ‘laser pressure’. Additionally, the laser beams have to strike the outer surface at extremely close to the same time. If the timing is off even slightly, the pressure waves will not coincide at the core of the pellet. They must arrive synchronously at the core for fusion conditions to be achieved. Current systems already synchronize the wavefronts of the lasers to picosecond precision. High powered lasers are the key to this technique, since acquiring fusion in this way requires a tremendous amount of energy to be delivered as a pulse. One major problem with even our most advanced lasers today is that they are relatively inefficient at turning electrical energy into beam energy. Additionally, not all of the laser energy ends up being delivered to the fusion target. Some of the laser light ends up being scattered or reflected away. Only about 1% of the electric energy that goes into powering the lasers is actually delivered to the target. This is presents a challenge in achieving energy gain factor parity, or Q = 1, since it means that we would need the fusions to release at least 100 times as much energy as was in the laser beams that struck the core. Additionally, the energy released from the fusions would be in the form of heat. Converting heat to electricity can be done at an efficiency of only 33-50% or so. This means that in total, the fusions have to release about 200-333 times as much energy as is contained in the laser beams in order to be a total net gain of electricity. With advances in laser technology, there are some hopes for lasers with efficiencies as high as 10-20% in the relatively near future. However, even with lasers that are about 1% efficient, it seems that Q=1 may be achieved quite soon in modern experiments. We talk below about the National Ignition Facility, which as of the writing of this article is undergoing experiments that are attempting to get near Q=1. The proposed ICF systems share several characteristics with the proposed tokamak designs. If you haven’t heard of the tokamak yet, you can read about them on Wikipedia, though we plan to publish an article about the tokamak in the next two weeks. All of the ICF proposals that I have seen are slated to use the D-T fuel cycle, which will create tremendous neutron blasts with every firing. This creates some difficulties in designing shielding and equipment for the core. Also, the core equipment will likely need to be regularly replaced on a time scale of years. However, core replacement for ICF should be easier than with a tokamak, because the tokamak has huge cumbersome magnets around the core. Another unsolved problem for both ICF and tokamak systems is the removal of heat energy from the core. In order to produce power, heat must be able to propagate at a high rate from the core and shielding. Utilizing D-T obviously introduces some problems for materials selection due to the tremendous neutron irradiation. ICF has an advantage over the tokamak in that it does not have to worry about any confinement equipment like the giant magnets around tokamaks. However, ICF does need to worry about damage to the optical components that are in or near the core. The National Ignition Facility has been completed at Lawrence Livermore National Laboratory in the United States. This is a project that is being very well funded partially because of the possible military applications. This facility is expected to reach energy gain factor Q=1. The facility was completed in early 2010. It is also expected to be the first device to ever reach the ignition state. The idea is to create a 500 terawatt flash of light that reaches the target from all sides within a few picoseconds. There are 192 beamlets which strike the outside of the pellet symmetrically. All of the original laser light for the beamlets is created from a single laser source and then split and amplified. The system is powered by a capacitor bank that holds about 400 MJ of energy. Nominal energy delivered to pellet is planned to be about 1.8 MJ. NIF should be able to fire every 5 hours, allowing 700 firings a year. The NIF uses a metal covering, called a hohlraum, around the fusion fuel. This metal will be superheated and explode when struck by the lasers. It will throw off a wave of X-rays when this happens. X-rays are very effective at heating the fuels in the core. Also, the X-rays released will create a more even energy pressure on the core than even the 192 lasers on their own could possibly create. As discussed above, even pressure is a key to successful achievement of ignition conditions using this technique. The technique of using a metal coating in this way is called ‘indirect drive’ because the laser energy goes primarily into heating the metal which in turn emits the X-rays that heat the core. The final internal shockwave that propagates to the core of the pellet is expected to have an energy ~140kJ. Each pellet is expected to release about 20MJ of fusion energy. 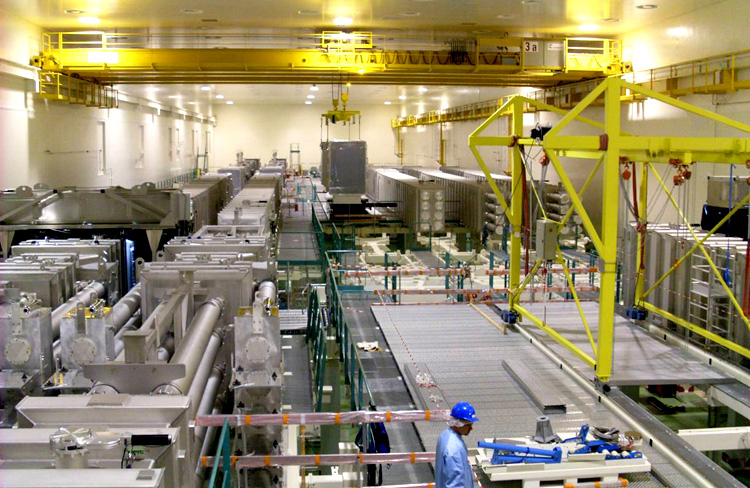 As of November 2010, fusion experiments are being conducted at the NIF. This is a very exciting time for people who follow fusion developments. The expected achievement of Q=1 by the NIF will be an important milestone in the history of fusion power. 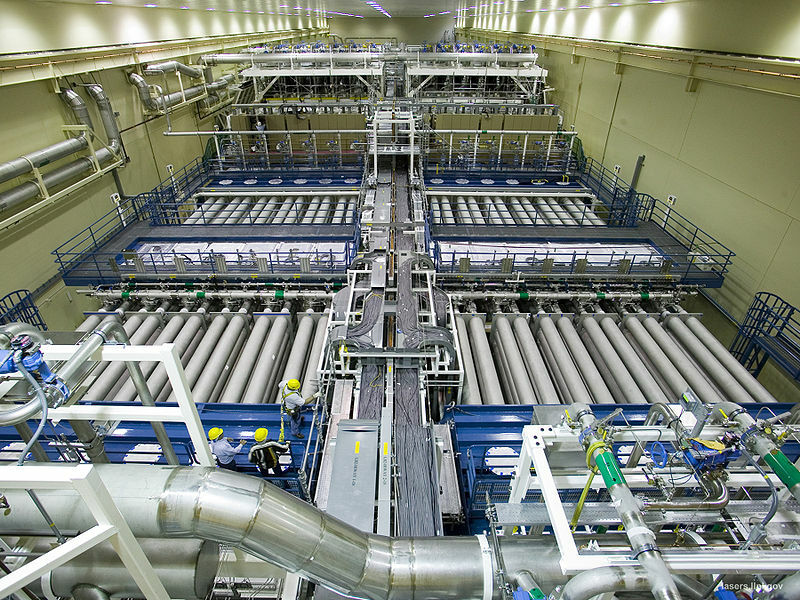 For a really cool video of how the National Ignition Facility works, check out their homepage, which as of November 17th, 2010, had a nice video of the ICF fusion process. Early considerations of laser implosion fusion led to overly optimistic predictions of when it would be possible. One of the early calculations said that as little as 1 kilojoule of laser energy would be enough to create fusion ignition. Mistakes in the early calculations were discovered, and additional difficulties have cropped up over the years. Eventually the US government decided to directly investigate exactly how much energy is needed to create this sort of fusion. This means that the original estimate was off by a factor of about 100,000. People complain about fusion ‘always being 20 years away’, and to be honest it looks like they have a right to be skeptical. The history of fusion is one of dramatically steep learning curves. Scientists in the 70s who claimed that we would have fusion reactors by the year 2000 were not just making things up to get their grants renewed. The understanding of science at the time seemed to indicate that such a timeline was feasible. As our understanding grew, we began to see just how difficult achieving fusion was going to be. Estimates today are based on a much more complete understanding of the underlying physics than was available in 1970. Yes it is possible that we are missing some things that will sabotage our efforts in the coming decades. However, I would claim that unknown difficulties will become more rare from today forward. Humanity is building devices that are achieving many of the necessary milestones needed for fusion. Every difficulty that is overcome does not necessarily spawn a new one. It is possible that we are aware of all the major difficulties now. It is also possible that there are a few yet to be discovered. As far as I can tell, it is the expectation of the scientists involved in these projects that progress will continue in the coming decades towards a feasible nuclear fusion power plant. The development of this sort of fusion power is looking to be expensive and slow, depending primarily on advancements in laser technology in the coming decades. There may be no fusion power plant in the future of this version of laser implosion fusion because other techniques that can achieve fusion ignition more easily may replace it. In our next post on nuclear fusion we will be taking a deeper look at some of these rising stars of the fusion world, the ‘fast ignition’ systems. For further reading you may be interested in our other articles on nuclear fusion.